Today, Intel unveiled the Intel® Optane™ SSD DC P4800X Series and Intel® Optane™ SSD DC P4800X Series with Intel® Memory Drive Technology, enabling new possibilities to transform storage and memory architectures for the data center. Deployed as blazing fast storage or caching tier, Intel® Optane™ SSD DC P4800X breaks the confines of traditional storage to significantly increase scale per server and accelerate applications. When deployed as extended memory, this drive expands the system memory pool, creating bigger, more cost-effective memory to gain higher quality insights. An industry-leading combination of high throughput, low latency, high quality of service and high endurance enable the creation of solutions that remove data bottlenecks, unleash CPU utilization and deliver unprecedented insights. Intel® Optane™ SSDs offer unrivaled performance at low queue depth, where the vast majority of applications generate storage workloads, which means CPUs are more active and more fully utilized. Intel® Optane™ SSDs for the data center let users do more work with the same servers, improving TCO or expanding capabilities. And because the drive is extremely responsive under any load, it is highly predictable and delivers ultra-fast service, consistently. Intel® Optane™ SSD DC P4800X Series will drive new solutions with applications such as artificial intelligence and machine learning, faster trading, and deeper insights into medical scans. It expands the reach of cloud computing solutions. 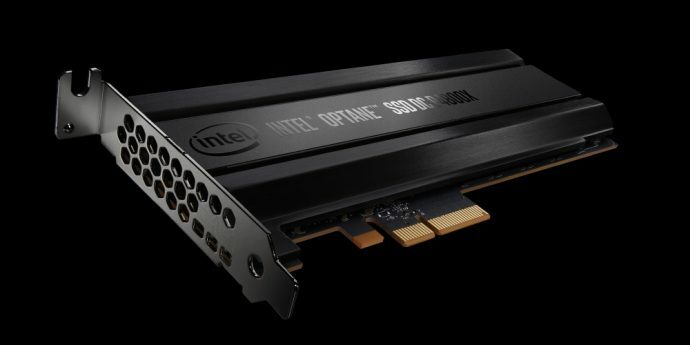 Intel® Optane™ SSD DC P4800X with Intel Memory Drive Technology enables data centers to deliver more affordable memory pools by displacing a portion of DRAM or significantly increasing the size of memory pools. This solution transparently integrates the drive into the memory subsystem and presents the SSD as DRAM to the OS and applications. Intel® Optane™ SSD DC P4800X Series (375GB, Add in Card) and Intel® Optane™ SSD DC P4800X with Intel Memory Drive technology is available now to customers in an early ship program. Additional capacities and form factors will be available in the second half of 2017. Visit the Intel product page to read more about the drive and how it unleashes possibilities. Read about specific uses cases utilizing Intel® Optane™ SSDs for the data center on the IT Peer Network.